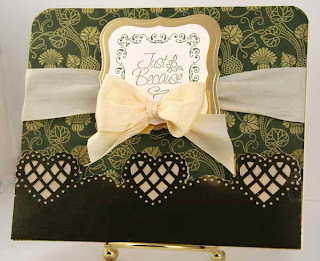 This card was created using Martha Stewart's new Lattice Lace Heart Edger. I punch out the hearts and pasted them on a cream card stock and then cut around the hearts to make them stand out against the green paper. The photo doesn't capture the gold foil very well, but it is quite stunning. JustRites new Square Border highlights the Just Because sentiment from the new Just A Note Stamp set. The borders were cut out using two sizes of Spellbinders Label one. I used the gold foil again to carry out the color theme. The back ground paper (green) is from the Graphic45 Renaissance Faire Paper Pad. Don't you just love it? It is so easy to achieve a vintage look with their paper. The patterns and colors in these paper pads are just gorgeous. And of course May Arts silk ribbon finishes the look I was trying to achieve. I hope you enjoy looking at it as much as I enjoyed doing it. I love this time of year, because there is more time to craft (must work on those taxes though). There is no gardening, canning, yard work or Christmas preparations. Do you all have more time now too???? Totally gorgeous card to wake up to - just love it!!!! Absolutely gorgeous creation Joan!! LOVE what you are doing with these new punches. Love it. I cannot wait to get my new MS punch to try it. Oooh this is gorgeous! Love this Joan! Wow, Joan, it's absolutely gorgeous! Love the layout and the colors, so beautiful!!! Wow Joan. This is so gorgeous. I really like that MS punch,the colors you used and your layout. Wow Joan, That is just too, too gorgeous! TFS! So happy you are back creating so I have new cards to case! WOW! What an absolutely beautiful card. You have done such a lovely job with it. I wish I did have more time to craft, but unfortunately, this is busy time at work for me - so I often have to put in longer hours. Super awesome card, Joan! LOVE the use of your sentiment! Those JustRite sets are so veratile! Hope you are doing well, my friend!